Antrim hurlers' hopes of a return to Division One are over after they suffered a 1-17 to 1-11 defeat by Carlow in Ballycastle. The Saffrons' second straight defeat in Division Two A means that even victory over London away next weekend will not be enough to keep their hopes alive. Carlow are two points ahead of Antrim but the head to head between them means they cannot catch the Leinster county. Barry McFall was sent off early on as Carlow led 1-12 to 0-6 at half-time. Martin Kavanagh hit Carlow's goal early on as Carlow took immediate control of the game. A James Connolly goal in the 51st minute helped Antrim cut the deficit to four points but Carlow hit the next three points to end any prospect of a Saffrons comeback, as the home side also had Neal McAuley red carded in the closing stages. Westmeath lead the table on a maximum eight points, with the top two teams set to meet in the Division Two A final and the winner then going on to a promotion-relegation play-off against the bottom team in Division One A. Going into next weekend's final round of games, Carlow have six points, with London on five and Antrim a further point back. 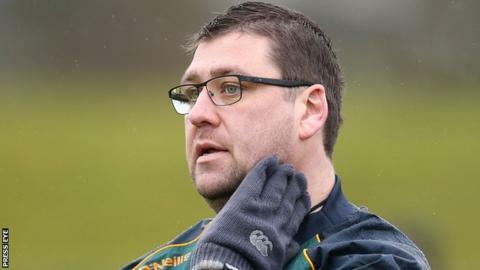 However, on the evidence of Sunday's contest, Antrim will struggle in London with new manager PJ O'Mullan, thus far, unable to halt the alarming slide which the Saffrons suffered in 2015.